Fifteen years ago, Vidya Charan Shukla dashed the Congress’s hopes of retaining power in Chhattisgarh by leaving the party and joining the Nationalist Congress Party. He was unhappy with the Congress high-command supporting Ajit Jogi as chief minister candidate. Shukla’s departure split Congress votes, and the BJP came to power in the state for the first time in 2003. Now, it seems, it is Jogi’s turn to do a Shukla. 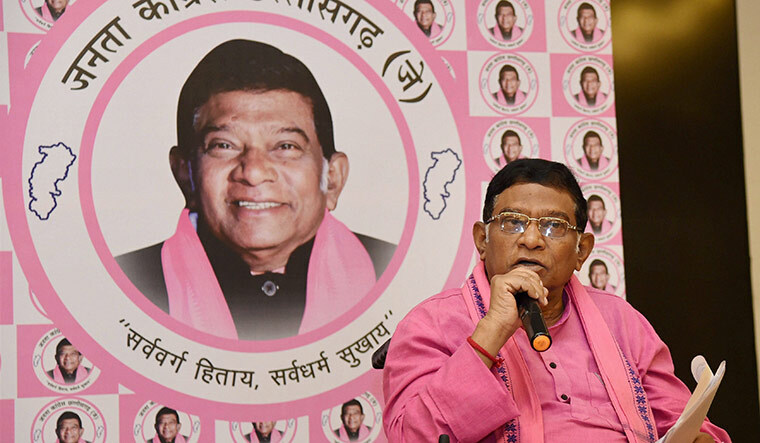 The former chief minister, who left the Congress in 2016 to form the Janata Congress Chhattisgarh, has joined hands with Mayawati’s Bahujan Samaj Party to form a third front in the state. It could be the biggest hurdle before the Congress in its efforts to regain power. Chhattisgarh had been a Congress bastion. When it was part of Madhya Pradesh, the region regularly contributed a good number of legislators to the party tally. In the past 15 years, however, infighting has substantially weakened the party. But this time, the Congress expects the anti-incumbency factor to turn around its fortunes. In the last assembly elections, the vote share difference between the BJP and the Congress was less than one per cent. Later, the Congress registered a thumping victory in the municipal polls. “Not just the Congress, but there are some 36 people’s organisations that are opposing the government,” said eminent Hindi author Diwakar Muktibodh. 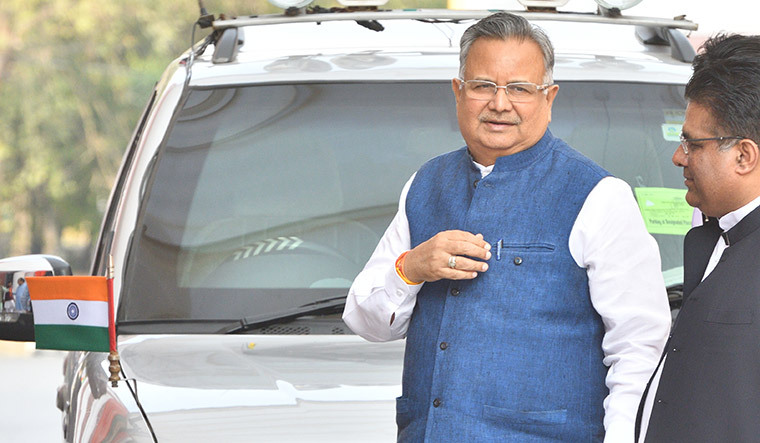 Chief Minister Raman Singh knows he has a fight on his hands, and has no qualms about admitting that Chhattisgarh is “essentially a Congress state”. “We have won election after election because of our positive and development-based agenda. We have set a target of 65 seats, and the way things are looking, it is an achievable figure,” he said. The state has 90 assembly seats. The Jogi factor is so important that both the BJP and the Congress are making their strategies around him. A former IAS officer, Jogi entered politics in 1986 at the behest of Rajiv Gandhi. In 2000, he became the first chief minister of Chhattisgarh. By striking a deal with Mayawati, he seems to have outmanoeuvred Congress general secretary P.L. Punia, who is in charge of the state. Punia was principal secretary in Uttar Pradesh when Mayawati was chief minister. He was handpicked by the Congress high command to checkmate Jogi’s crafty ways. But it seems to have proved counterproductive, as Mayawati, who had an axe to grind with her former aide, quickly agreed to align with Jogi. State Congress chief Bhupesh Baghel said Jogi would not affect his party’s chances. “His presence in the Congress harmed us in the past two elections. He generates so much negative emotions among the common people,” he said. But the Congress suffered a setback on October 13, when senior leader Ramdayal Uikey quit the party and joined the BJP. In the 90-member Chhattisgarh assembly, 10 seats are reserved for scheduled castes and 29 for scheduled tribes. The Congress won 18 tribal seats in 2013. In the past five years, however, the BJP government started special schemes in the tribal-dominated Bastar and Sarguja regions. It has come out with a special budget of Rs2,400 crore for the tribal areas. Jogi’s party is run by his son Amit, who has been working hard to establish himself as a leader. But many leaders quit the party because of the differences with Amit. The exodus stopped only after the alliance with Mayawati materialised. The Janata Congress Chhattisgarh will contest 55 seats and the BSP 35. For once, the Congress’s election preparations have been on track. Punia has been focusing on building the organisation rather than humouring overambitious state leaders. “The Congress over the years has learnt from its mistakes and has focused more on its organisational structure,” said Ramesh Nayyar, former chairperson of the Chhattisgarh Granth Academy. Also, the party hopes to forge an alliance with the tribal outfit Gondwana Ganatantra Party, which secured five per cent votes in the last elections.